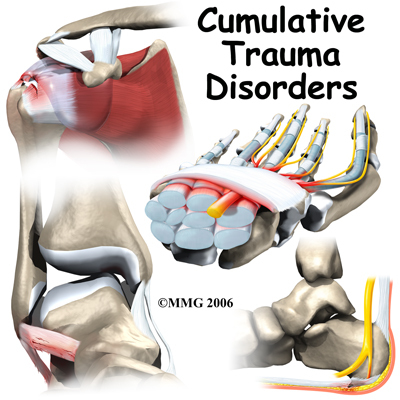 Welcome to Choice Physical Therapy of Ohio's patient resource about Cumulative Trauma Disorder. When you visit Choice Physical Therapy of Ohio, our Physical Therapist will begin the evaluation by taking a history of your problem. We’ll probably ask questions about your job, such as the type of work you do and how you perform your job tasks. Answers to other questions will give us information about your work conditions, such as the postures you use, the weights you have to lift or push, and whether you have to do repetitive tasks. We may also ask about how you like your job and whether you get along with your supervisors and coworkers. Choice Physical Therapy of Ohio provides Physical Therapist services in Blue Ash and Groesbeck. At Choice Physical Therapy of Ohio many nonsurgical treatment approaches are used by our Physical Therapy and occupational therapists to reduce the symptoms of CTD-related conditions. Our Physical Therapist will want to gather more information and will further evaluate your condition. The answers you give along with the results of the examination will guide us in tailoring a treatment program that is right for you. At Choice Physical Therapy of Ohio, our goal is to help you understand your condition, to look for and change factors that may be causing your symptoms, and to help you learn how to avoid future problems. When your recovery is well underway, regular visits to our office will end. Although we will continue to be a resource, you will be in charge of practicing the strategies and exercises you've learned as part of an ongoing home program. Choice Physical Therapy of Ohio provides services for Physical Therapy in Blue Ash and Groesbeck.